описание (ru) XSplit Broadcaster программа для захвата экрана компьютера и трансляции различного видео материала. Программа позволяет переключаться между различными источниками вещания во время стриминга, добавлять контент с видеокамеры, добавлять выбранные участки экрана компьютера, изображения и флеш контента. Программа XSplit Broadcaster содержит множество инструментов для настройки качества изображения и сигнала трансляции с учетом возможностей компьютера. Программа поддерживает работу с популярными сервисами YouTube, Twitch, Dailymotion, GG ! !, Justin.tv, Ustream и другие. Также программа XSplit Broadcaster 3 дает возможность сохранять трансляции на компьютер для дальнейшего анализа и редактирования. description (en) XSplit Broadcaster Simple, powerful and flexible live streaming. A simple yet powerful live streaming and recording software that powers countless live streams and recordings around the world. XSplit Broadcaster is the perfect solution for producing and delivering rich video content. • Stream and Record in 4k60fps and beyond: XSplit provides the best video quality possible. • Unlimited Scenes and Sources: unleash your creativity with the tools to create the perfect broadcast. • Projector Mode: display various scenes to any device connected to your PC’s GPU. • Whiteboard and Stream Annotations: perfect for shoutcasters and live events, provide live analysis and illustrations. • Scene & Source Transitions: preloaded with a variety of transition styles and add custom stinger transitions. • Scene Preview Editor: edit scenes before pushing live with the Preview Editor. • Macros Extension: allows you to script virtually any action or series of actions in XSplit 3 crack. • Robust Text Source: supports custom scripts. • Drag and Drop various media files directly into the mixer. • Support for all popular capture cards and webcams: Logitech, Elgato, AVerMedia, Razer and more! • Express Video Editor: edit together multiple video files and upload directly to YouTube in just minutes! • Chroma Key: support for background removal. • Enhanced Audio: create high fidelity sound with various encoding and rendering options. • Audio Mix Preview: connect a listening device to attain the perfect mix for the broadcast. • Multi-track Audio Recordings: separate microphone and system audio in separate tracks to offer more editing possibilities. 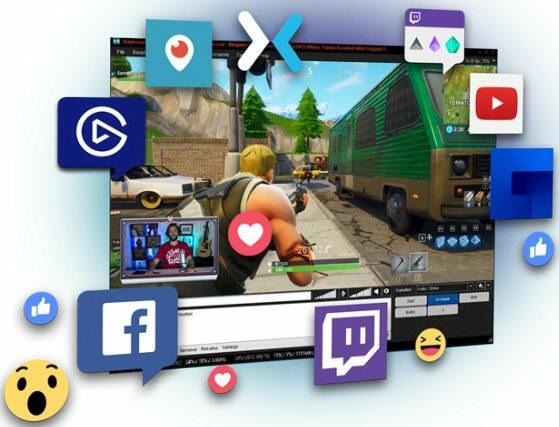 • YouTube Super Chat and Twitch Cheers Alerts. • Facebook Chat, Mixer Chat, Twitch Chat, and YouTube Chat Widgets. • Supports all web based alerts and widgets. • Simultaneous broadcasting to multiple stream services.